Revolution Greens: Are Humans Herbivores?? Although many modern humans eat a wide variety of plant and animal foods, earning us the honorary title of "omnivore," we are anatomically herbivorous. Biologists have established that animals who share physical characteristics also share a common diet. Comparing the anatomy of carnivores with our own clearly illustrates that we were not designed to eat meat. To contrast human physiology with that of carnivores, start at the beginning of the digestive tract. Teeth, nails, and jaw structure indicate that nature intended for people to eat a plant-based diet. They have much shorter and softer fingernails than animals and pathetically small "canine" teeth (they're canine in name only). In contrast, carnivores all have sharp claws and large canine teeth capable of tearing flesh. The jaws of carnivores move only up and down, requiring them to tear chunks of flesh from their prey and swallow it whole. Humans and other herbivores can move their jaws up and down and from side to side, a movement that allows them to grind up fruit and vegetables with their back teeth. Like other herbivores, human back molars are flat and allow the grinding of fibrous plant foods. Carnivores lack these flat molars. 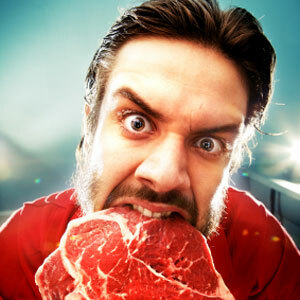 If humans had been meant to eat meat, they would have the sharp teeth and claws of carnivores. Instead, their jaw structure, flat molars, and lack of claws indicate that they are best suited for a plant-based diet. Dr. Richard Leakey, a renowned anthropologist, summarizes, "You can't tear flesh by hand, you can't tear hide by hand. Our anterior teeth are not suited for tearing flesh or hide. We don't have large canine teeth, and we wouldn't have been able to deal with food sources that require those large canines." After using their sharp claws and teeth to capture and kill their prey, carnivores swallow their food whole, relying on their extremely acidic stomach juices to do most of the digestive work. The stomach acid of carnivores actually plays a dual role-besides breaking down flesh, the acid also kills the dangerous bacteria that would otherwise sicken or kill the meat-eater. As illustrated in the chart below, our stomach acids are much weaker in comparison because strong acids aren't needed to digest pre-chewed fruits and vegetables. 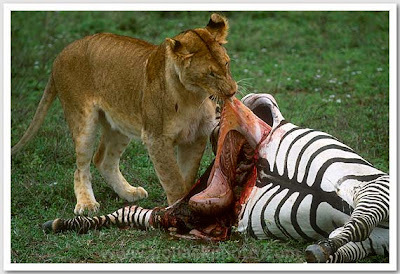 In comparing the stomach acidity of carnivores and herbivores, it is obvious that humans fall into the latter category. We can cook meat to kill some of the bacteria and make it easier to chew, but it's clear that humans, unlike all natural carnivores, are not designed to easily digest meat. Evidence of our herbivorous nature is also found in the length of our intestines. Carnivores have short intestinal tracts and colons that allow meat to pass through it relatively quickly, before it has a chance to rot and cause illness. Humans, on the other hand, have intestinal tracts that are much longer than carnivores of comparable size. Like other herbivores, longer intestines allow the body more time to break down fiber and absorb the nutrients from a plant-based diet. The long human intestinal tract actually makes it dangerous for people to eat meat. The bacteria in meat have extra time to multiply during the long trip through the digestive system, and meat actually begins to rot while it makes its way through the intestines. Many studies have also shown that meat can cause colon cancer in humans. Comparing our anatomies clearly illustrates the fact that the human body is built to run on a vegetarian diet. Humans have absolutely none of the distinguishing anatomical characteristics that either carnivores or even natural omnivores have.Read author John Robbins' discussion of the anatomical differences between humans and carnivores. Here is a chart from "The Comparative Anatomy of Eating" by Dr. Milton Mills that compares the typical anatomical features of carnivores, omnivores, herbivores, and humans.2 Notice how closely human physical characteristics match those of herbivores. Ineresting post RG. Makes me re-think my dinner plans for sure.